One of the criteria we look at when partnering with a supplier is their commitment to Social Responsibility / Sustainability. 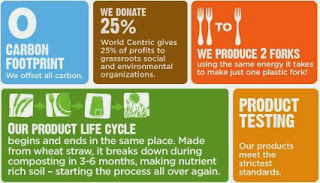 On this front, we’re proud to say that World Centric is really head and shoulders above most companies and is a true social leader in the food service space. Offsets their entire carbon footprint. Donates 25% of their proceeds to grassroots environment & social organizations with a goal of eventually donating 100% of their proceeds to organizations that positively affect our world & environment. Tests all products to ensure they are 100% compostable as certified by the industry leaders in composting standards (i.e. BPI and ASTM). Sells 5-compartment compostable lunch trays to K-12 schools at cost to encourage schools to move away from Styrofoam / expanded polystyrene trays that are polluting our environment. Audits all of their factories for compliance with fair labor guidelines to ensure fair wages & working conditions. Encourages employees to use public transportation on their way into work through a $250 monthly reimbursement. Powers their office with renewable wind & solar energy from Palo Alto Green. Regularly hosts community events including a social justice film and speaker series. For more details check out World Centric’s Sustainability page (again, fantastic transparency here that other companies should take note of).